Of all the jobs in the world out there, if there is any job which is always held in high regard, it has to be the job of serving one’s own nation, serving in the army. It is also the toughest job one can enrol themselves into. The army is undoubtedly the pride of a nation. It’s because it lives up to its ideals of defending the country against all dangers. The army is what safeguards us citizens and ensures that we keep enjoying the freedom, granted to us by our Constitution, every single day of our life. The army men truly deserve all our respect, gratitude, and adulation for what they do for us all throughout their life. But we’re sure you must have heard of the saying, “Behind every successful man is a woman.” This holds especially true for the army men. Every army man has a very loyal, loving, praiseworthy wife, who is the support system that helps him serve his nation, without any worry. Because, he is sure that his wife back home is fulfilling the duties of being a son, a father, or even a brother, on his behalf. This one is dedicated to all those army wives out there! 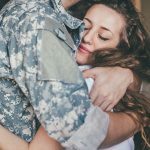 We’ve written down some things that an army wife goes through and if you yourself are an army wife, we’re sure you’ll relate to these. During your childhood, if you ever had a friend whose dad worked in the army, you’d remember how your friend had to shift their base so often. That’s the tale of an army family, right? Every now and then the postings keep changing to various cities of the country. And this means that the entire family also keeps shifting, never being able to lay roots at one place. Shifting house to different cities will mean that the wife spends a good chunk of her time boxing, unboxing, and then re-boxing the household items. Don’t we crib about cleaning homes on festive occasions? Now, imagine shifting everything on a regular basis. Tough, right? But army wives do it, and with every change in the postal address, they only get quicker at packing things. It’s only through a message that you get to know that your husband is doing fine. Even though it’s an army man who takes the vows of not thinking twice before sacrificing his life for the country, his wife too is prepared for every consequence ever since she decided to wed an army man. Once he is off to the field on his posting, away from his family, all that his wife does is wait for messages or signs that prove every fear of hers wrong. And it doesn’t help when others keep reminding or asking her about her husband’s impending homecoming. You miss him, you’re waiting for him, and you still need to display a composed demeanor to show everyone that you’re a strong army wife. Keep that spirit up, dear ladies, we’re with you! When you’re an army man’s wife, you’ll find yourself learning and doing a lot of things which are mostly done by men (society-driven traditions say so, we don’t). Maybe you never knew those skills before getting married. It’s only after your marriage that you, learned them and now you do them on your own. The life situations you face now, made you learn an umpteen number of skills because of which you can rightfully be called a “multi-talented” woman! Being an army man’s wife, you’re not just expected to maintain relations with your in-laws, you have an even bigger family to take care of — your husband’s army family! You will have to attend most of the social gatherings of the army where you’ll end up meeting your husband’s juniors, seniors, and their spouses. Very soon you’ll find yourself become a part of a group that has shared army experiences in their capacities as soldiers or their better halves. This will be your extended family. Even your children will be doing the same. They’ll end up making friends with sons and daughters of the heroes of our country. It undoubtedly is the toughest part of being an army wife. You can’t stop yourself from worrying about your husband’s safety. On days when the worry storm takes over your body and mind, you still find yourself doing the everyday chores of the family wearing a normal face. It is in times like these that you realize that you’re stronger than you think. And with every passing day, you’re only growing stronger and are acting as the source of strength and trust for your husband out there, who is relying on you to keep his family hale and hearty.